While you’re waiting for the water to boil, dice the pancetta and start cooking with the olive oil in a saute pan. Next, slice the onion or shallot and throw in the pan with the pancetta. Allow the onions to caramelize over medium heat. Toss in the pea shoots and let them just begin to wilt. This should be happening while you cook your pasta. If the onions mixture is done before the pasta finishes, simply turn the heat off. 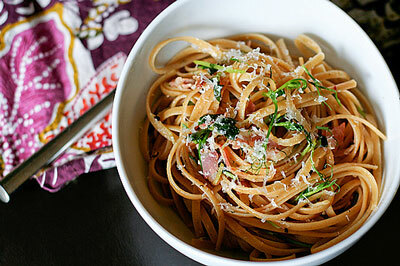 When the pasta is cooked, strain it and return to it’s cooking pot, adding the onion/pancetta/pea shoots and mixing well. Grate the lemon into the pot, and squeeze in lemon juice to your liking. Grate as much parmesan or pecorino as you’d like over the pasta, as well as the chopped fresh mint and a healthy grind of fresh black pepper.